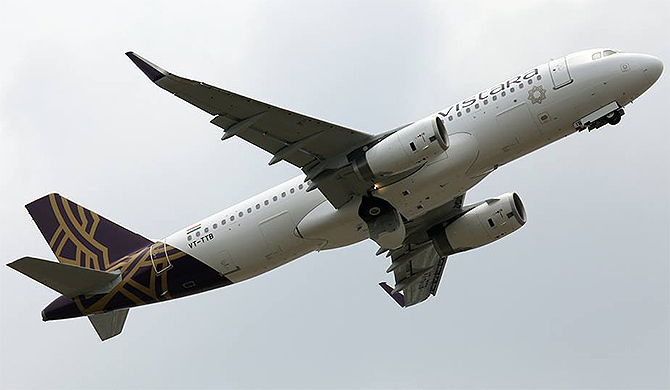 Tata group and Singapore Airlines-owned Vistara will add more seats to its single aisle jetliners as it aims to shore up sales and improve cabin economics. Vistara, sources say, will add one more row of seat to its economy cabin, which will take its total seat count to 164 from the current 158. Currently, the airline has eight business class, 24 premium economy and 126 standard economy seats. The new seating arrangement will be available in the new aircraft that the airline adds to its fleet. At present, the airline operates 21 aircraft of the Airbus A320 family and has placed an order of 50 more of the Airbus A320 and Airbus A321 Neo variant. This is the second time that the airline is changing its seating configuration. The airline, which started with 148 seats, reduced business class seats to increase total seats to 158. To make space for the extra row, Vistara has opted for the smartLav concept offered by Airbus. The design allows more cabin space by shrinking the size of the lavatory, allowing an airline to add one extra row. Adding extra seats would mean that Vistara would reduce the seat pitch - the distance from one seat to the other in the row ahead - for the last four rows. However, a Vistara spokesperson didn't respond to queries. The move is one more indication to the challenge that full service carriers face to maintain a balance between offering comfort and controlling cost in a price sensitive Indian market. While fares have largely remained flat, jet fuel price has risen 22 per cent and rupee has depreciated 6 per cent from January until date putting pressure on airlines. "The sustained rise in crude oil price, coupled with rupee depreciation, poses a near-term pressure on profitability. India's aviation market remains an unattractive proposition as industry headwinds could weigh on sector profitability," SBI Caps noted to its clients. Operating in such a market, Vistara is yet to become profitable and has been able to corner only 4 per cent of the domestic market. Last year, the airline earned Rs 3.36 per seat for 1 km, while spendingRs 4.69 for the same. In comparison, low-cost airline IndiGo, which commands 40 per cent share of the market, spent Rs 3.04 to earn Rs 3.40. The airline started unbundling its product where flyers opting for a cheaper fare will have to buy meal on board. Rival full-service carrier Jet Airways has also moved to a piece concept for check-in baggage, which means economy flyers are allowed one piece of luggage for free check-in. The step is expected to free up belly space boosting cargo revenue and help in faster turnaround of aircraft.